With more than a dozen models currently available, there are Stamina exercise bikes for every type of riding. Stamina Products Inc. was founded in 1987 with a primary focus on fitness equipment. Under the Stamina brand, they make exercise bikes, elliptical trainers, treadmills, rowers, strength systems, and free weights. Other Stamina owned brands include Body by Jake®, Suzanne Somers, Tony Little, Cosmopolitan®, Brenda DyGraf, Denise Austin and BodyShaping®. Stamina was the first company to offer an affordable Pilates reformer for home use, the AeroPilates Performer. Other products marketed through infomercials include the InStride Walker, the Body Dome, and the Gyrotonic Transformer. Stamina’s wide range of products is available in stores, online, and on TV shopping networks. 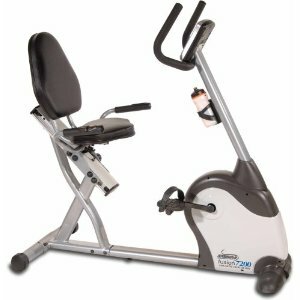 Stamina exercise bikes come in more than a dozen models of Recumbent Bikes, Recumbent Bike/Rowers, Upright bikes, Indoor Cycles for spinning, folding models, and an open flywheel Air Resistance Bike. Prices range from a budget-level $225 bike and up to $999 for the Elite Recumbent. The company has also introduced Stamina® Fusion bikes which is a new hybrid category that combines the traditional biking feel of the upright with the comfort of the recumbent for an exercise bike. The Indoor Cycles are group spin bikes that offer the consistent cadenced ride of a real road bike with the weighted 40-lb flywheel, smooth pedal bearings ensure a quiet but intense indoor training session, and easy command controls. The seat adjusts horizontally and vertically, as well as fore and aft to fit any size rider. Stamina Folding Recumbent and Upright Bikes are value-priced at just $249. Exercise bike reviews on these models are overwhelmingly favorable with users remarking that the frame has proven to be more solid than expected. If you don’t have room for even a compact upright bike, these folding models are real space savers. 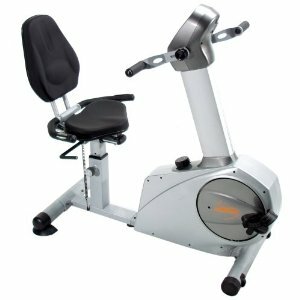 The Stamina Airgometer exercise bike is a real find at just $499. It is for serious workout enthusiasts who don’t mind a noisier machine and want to work both the upper and lower body. The dual action handlebars work the arms, shoulders, and back to add significantly more intensity to the workout. As we mentioned, there are a lot of models to choose from, so it's just a matter of finding the ones with features and price that appeal to you. All of them are quite affordable, and most receive very positive reviews from customers. So take a look at all of the offerings to see which one is right for your needs. In the past, there were some cheap $130 Stamina exercise bikes on the market that got bad reviews proving that even an innovative company like Stamina can only cut so many corners before quality is affected. Those models were discontinued as Stamina turned their efforts on making better bikes in the $499 - $799 range. The results are a substantial win for their customers and Stamina’s business goals. Stamina 7200 Magnetic Fusion Recumbent - A comfortable model for average to tall users. There aren’t many bikes out there that can match the features and comforts of this recumbent. Stamina Elite Total Body Recumbent - Reviews on this bike are 90% positive. A quality bike, comfortable and quiet, but don’t buy if you aren’t planning to use the upper body workout.